If there’s one thing the attempted Turkish coup is making evident, it’s the riot of delusions that so many have about Turkish president Erdogan & about the character of his rule. On Twitter, a leading Palestinian supporter mocked the notion that Erdogan would conduct a purge if he survived the coup. As of yesterday, only three days after the attempted coup, he had already fired 24,000 teachers & 1,577 university deans & dragged in 7,500 alleged plotters. Will they face trial or just disappear in the gulag? Others are lauding the survival of Erdogan as the “democratically elected” president when his 2014 election campaign was riddled with corruption charges from international observers. Many are completely ignoring his violence against Kurds, his repression of democracy protesters, his raids on newspaper offices & arrests of reporters, his unsavory agreement with the EU for accepting deported refugees in return for money. Some Assad opponents are calling on Erdogan to militarily enter the war in Syria against Assad. The credulity is beyond tragic, not to mention foolish, since as the second largest force in NATO, Turkey is already involved in Syria in many ways, including allowing the US to use its airbases. There is an alternative to the autocracy of Erdogan & that of a military junta. That alternative is the democracy movement in Turkey. Standing against the coup does not mean standing with Erdogan. The distinction is not subtle & should not go over the heads of so many who support democracy in Turkey. 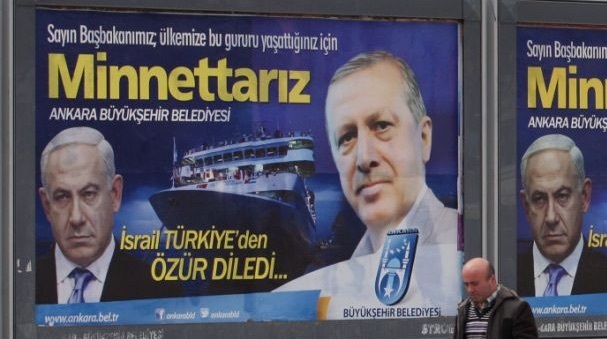 The photo is a billboard in Ankara, Turkey in 2013 with photos of Netanyahu & Erdogan celebrating Israel’s apology.